These ladders are perfect for use in the warehouse, stock room, or general plant maintenance. Aluminum provides light weight and durability. 20" x 21" embossed non-skid platform. 4" step tread depth offers maximum slip resistance. Double handrail extends 30" above the work platform. Back handrail may be removed for use as a pass through stand. 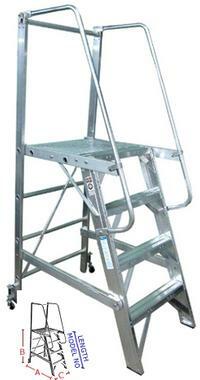 Retractable casters for ease of moving and positioning the ladder. Shipped knocked down...quickly and easily assembled. Heavy duty slip resistance material used at all floor contacts.